Rating: 1 Avoid it! This is just another Binary Options scam! The Good: There is a slim possibility that you can make some money, though CFD Society will have nothing to do with it. The Bad: Everything! CFD Society is trying to sell you on Bianry Options in order to maker a commission when you deposit money with the broker. They will tell you anything to make you do it! The Bottom Line: Binary Options betting is basically betting on a coin flip. Would you trust someone who told you they could guarantee if a coin would land on heads or tails? Not in a million years. Avoid binary option trading scams and stick with our tried and true methods of making money online instead. The thing about the internet is that anyone can basically pretend to be someone else and get away with it. If that person is just trolling someone on a forum then there’s no major harm, but when it comes to people selling you things and faking it, well that’s a whole different kettle of fish! Now, because there are so many systems out there that suggest they can help you make money online, in can be hard to spot the fakes. This is especially so as websites become easier to make and easier to make them look professional. Add in some decent sales copy and scam sites are often difficult to tell apart from the real things. That’s why I want to talk to you about CFD Society, a system that looks amazing on the outside but stinks of rottenness when you peel back the surface. 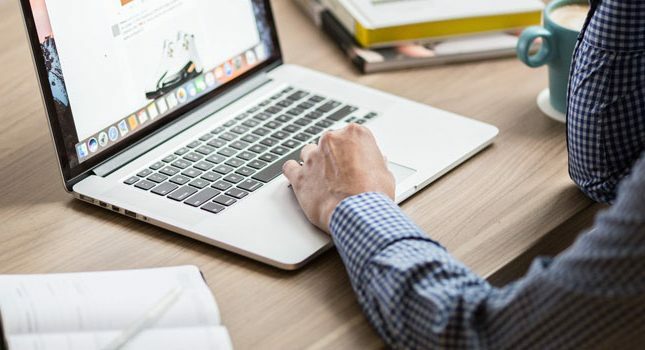 If you’re looking to make money online then you may have received an email about the CFD Society in your inbox, especially if you’ve shown interest in trading and Forex in the past. What is the CFD Society Exactly? The CFD Society is a Binary Options signal system. The idea is that through its “software” it can detect whether or not you should bet higher or lower on a Binary Options trade so that you can successfully win it. If you’ve never come across Binary Options before then let me give you a quick lesson to explain exactly what it is. Basically Binary Options is a type of trading system. Unlike traditional trades you don’t buy stock in the hope that the value will go up over time. Instead you are given a time period (normally in the range of 1 minute) and choose a stock option type. You then need to decide if the value of the stock will be higher or lower at the end of the time period than it was at the start. If you get the answer correct, you earn money. If you’re wrong, you lose. It sounds simple enough right? Why not just use the general trends of the stock? Well, therein lays the fundamental issue with Binary Options. Stock prices when looked at over the long term usually gradually go up or down with the occasional spike either way. When examined over a minute, stock prices fluctuate wildly. This means there’s little to no hope of choosing the correct choice of up or down in any scientific way. Systems like CFD Society always state that their software can accurately predict the direction, normally with silly figures of 99% accuracy. Sadly, these are all lies, as there is no software that can predict it due to the wild nature of the fluctuations. For this reason alone I believe CFD Society to be fake but there are other issues as well. Who indeed! According to the sales pitch Chris Chase is a well-known figure in the investment circles having been featured on Fortune, Forbes etc. It seems odd then that a well-known figure would put his name to a high risk system like Binary Options. 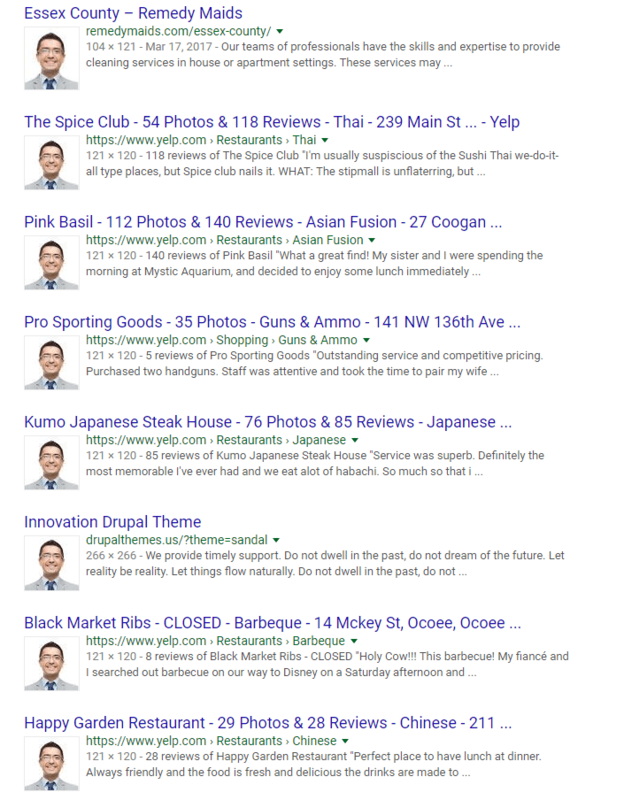 It’s odder still that he’d use stock photography to represent himself. 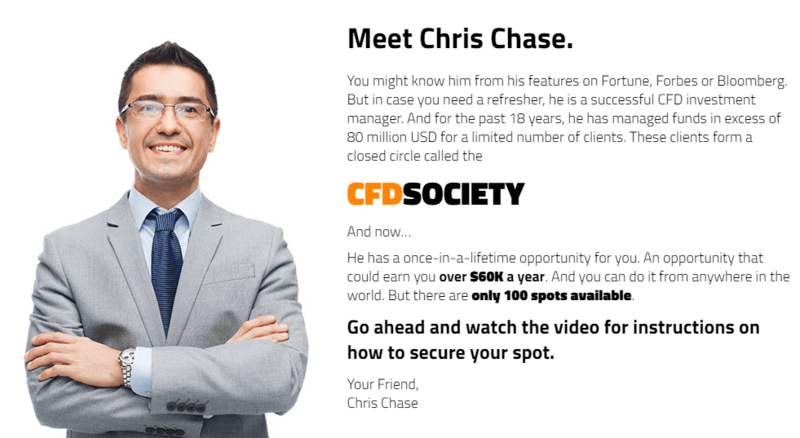 While there is a real Chris Chase out there in the investment circles, I’m convinced that the guy on CFD Society is simply made up, but with enough similarities to pass a quick Google search. Binary Options is a real way to make money online. However, it’s not a very good way to make money. It’s closer to gambling than it is to true trading simply because you cannot use experience and knowledge of trends to make a decision. 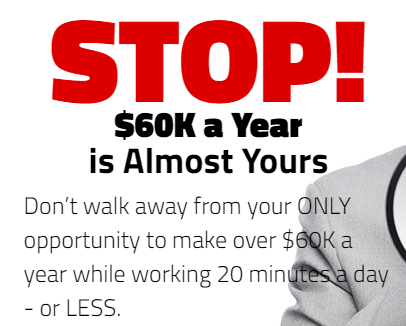 Most people who try Binary Options walk away with less money than they started with so when you hear claims of making $60,000 a year it beggars belief. 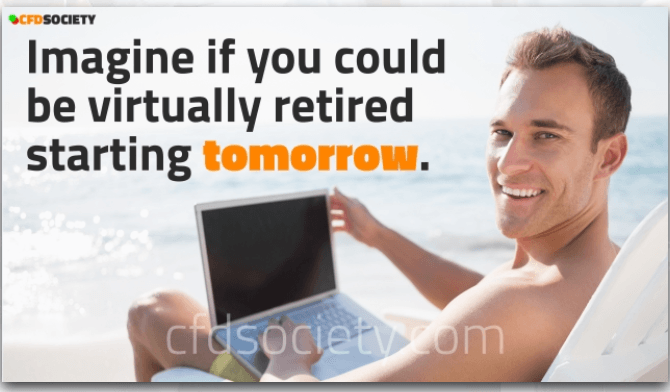 As well as that CFD Society claims you can make this amount of money by working just 20 minutes a day. Claims like this having no bearing in reality. In fact there is no proof offered by the system to back these claims up. 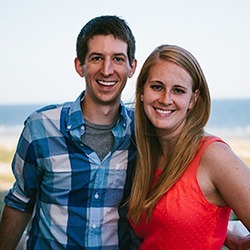 When buying online, and especially for software, it’s hard to make a decision so testimonials play a huge part in deciding. That’s why it’s terrible to see fake testimonials like those shown on CFD Society. Normally, scams like this pull images from stock photos, but CFD Society goes one step further and pulls images of real people from LinkedIn. I suppose this is to try and legitimize the service, because you could say that maybe these people just didn’t want their names shown? Well, what about the testimonials that is just stock photos? I’m pretty sure not one of these people is a real user of CFD Society! What if you buy into CFD Society and hand your money over to the broker and then lose your money? Well, you out of luck! 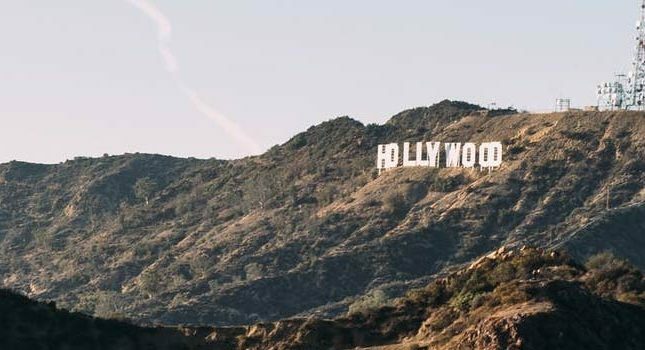 Not only does CFD Society have no terms, disclaimers or contact information (the links all go back to the home page), most Binary Options brokers are based out of the country to avoid legalities! The video for this system could take up hours of my time because there is that much BS in it! 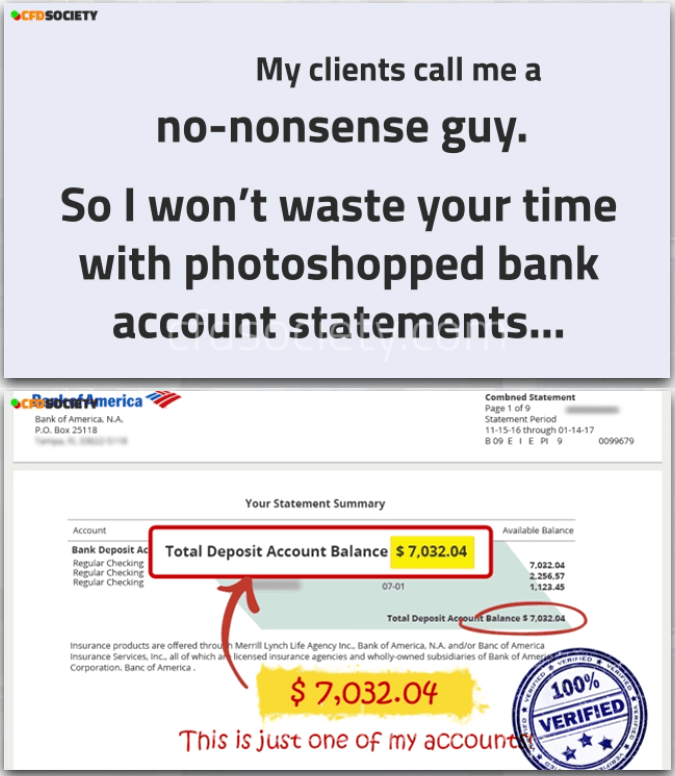 Some of the choicest bits would be not showing you Photoshopped bank statements (right after showing you one). Then there are the signs of wealth dripping throughout the video (working from the beach, lavish lifestyle shots, etc). These are common in scams, shown in order to take your eye off the ball. The video is just hype without any real substance. CFD Society tries to get you to sign up to the system by using aggressive marketing techniques that work on your emotions and insecurities. All it’s going to deliver you is yet another fake system that has no better chance of making you money than flipping a coin. Binary Options is a high risk method of making money and CFD Society does nothing to mitigate this problem. In my opinion, steer clear of the CFD Society and Binary Options in general!